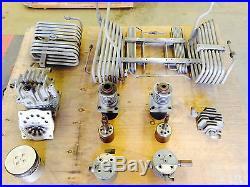 INGERSOLL RAND MODEL HP1000 HIGH PRESSURE COMPRESSOR PARTS - Parts came off a machine with a failed second stage. Unit had about 600 hours on it, parts are in great condition. Includes: 1st, 3rd, and 4th stage pistons; 1st, 3rd, and 4th stage cylinders; 1st, 2nd, 3rd, and 4th stage head assemblies; all cooler assemblies SHELF 11 BIN 1. FOB POINT: The item listed is FOB our warehouse in Cranbrook, BC (Canada) OR Eastport, Idaho (USA), BUYERS CHOICE. Due to the number of viruses that are presently circulating we do not open emails which do not have a clearly defined subject. The item "INGERSOLL RAND MODEL HP1000 HIGH PRESSURE COMPRESSOR PARTS" is in sale since Tuesday, July 19, 2016. This item is in the category "Business & Industrial\Light Equipment & Tools\Air Compressor Parts & Accs\Other Air Compressor Parts". The seller is "st_eugene" and is located in Eastport, Idaho. This item can be shipped to United States.